Convenient 750ml Trigger Bottle - Perfect for when an EzyWipe is just not enough. No Odour. Spray it on and wipe it off. No clean up required afterwards. Removes texta, markers, felt pen and spray paint from concrete, painted surfaces and other sensitive surfaces. Ideal for high traffic pedestrian areas and use in confined spaces. EzyClean Supasafe Graffiti Remover makes the ultimate whiteboard cleaner and no need to worry about accidental permanent marker mistakes, they wipe away too. 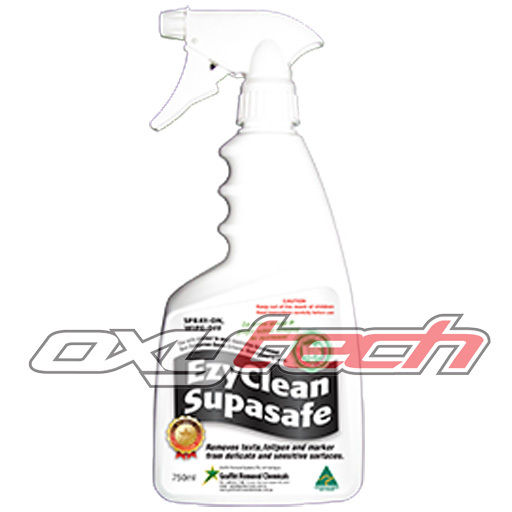 EzyClean Supasafe is the only graffiti removal product to meet all Australian Government Non-Dangerous Goods criteria. Non Flammable. Non Corrosive.